We are in the middle of summer now, and I feel like every summer I am always on the hunt for the perfect pair of white shorts. 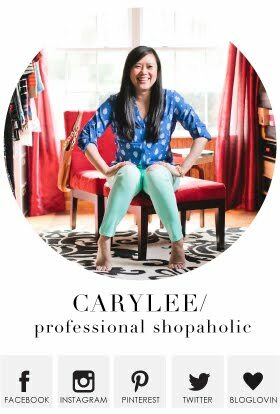 I've had pairs in several brands - Express, Gap, Old Navy, Banana Republic, you name it. 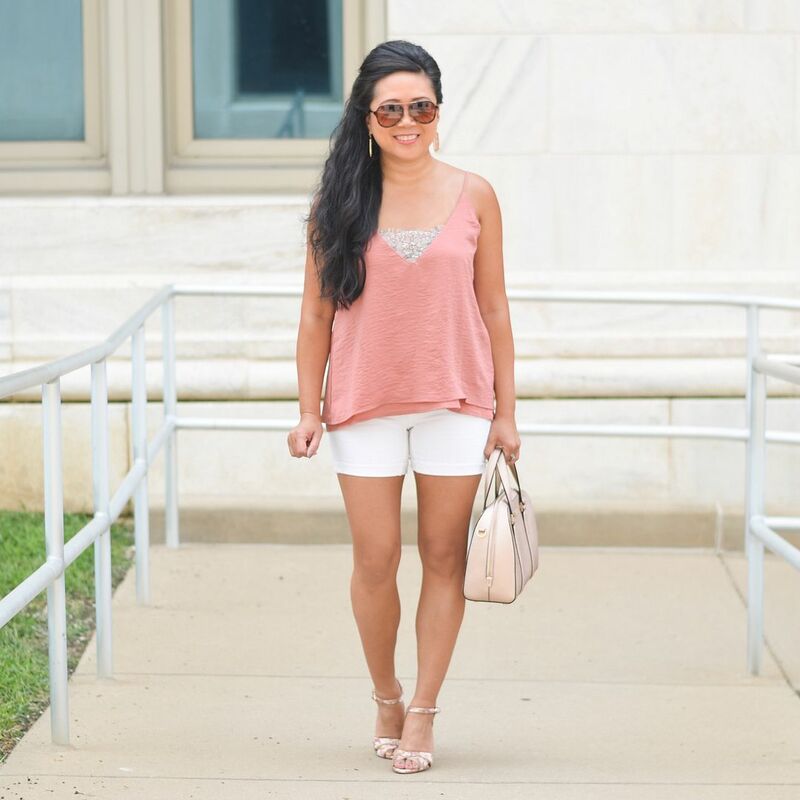 Grace and Lace has this pair of white shorts right now that keep going in and out of stock and the hype left me really intrigued. I was THISCLOSE to ordering them actually, but I ended up not pulling the trigger. They have a bit of a higher rise, and I find myself always HATING shorts or jeans with a higher rise. My belly is my problem area - specifically the area above my pelvis but under my belly button. For the sake of this discussion, let's call that my inner tube. Higher rise anything seems to accentuate that part of me since most of the support ends up being above my inner tube. And think about what happens when you squeeze a balloon. The adjacent parts bulge as a result. So when my torso is being locked and loaded above my inner tube, I feel like my inner tube bulges even more! It's not good, and this has got to be creating really wonderful mental pictures in your head right now. So! Long story short, I recently bought two pairs of shorts this summer (both seen in this post here) from American Eagle and they are so buttery soft yet supportive in all the areas I need them to be. I hadn't bought a white pair from American Eagle in a long time, so I decided to take the plunge on this pair and they are just as good as I hoped they would be. I am wearing them in my normal size - a 4. They are a midi length so the inseam is longer than I normally go for shorts. But proportionally, I'm still happy with the way these fit since the leg openings are more fitted. (Fitted but definitely not tight.) I feel that a baggier pair of shorts like this with the same inseam length may look a bit off on me and not elongate my legs as much. Although I didn't order the shorts from Grace and Lace, I did go ahead and snag this top during one of their recent sales. It received a ton of great reviews, and for good reason. I had been wanting a lace trim cami, and the relaxed fit of this is great. I love the contrasting-colored-lace detail as well as the double layered hem. I took this in my normal size small. It has adjustable straps for an even better fit. If you are in between sizes, I would size down for sure. By now I'm sure you're overdosing on all of the blogger coverage of the Nordstrom Anniversary Sale. But, if you're a glutton for punishment and you missed my recap - you can get yourself caught here. I always like to put my wishlist together and shop the sale before getting influenced by what others are buying and hating. That way I know what I'm drawn to is what *I* genuinely like, and hopefully *you* feel that my picks and feedback are genuine as a result. 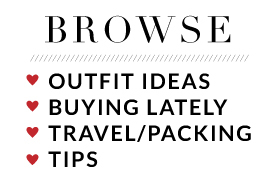 That said, once I finished my recap post, I started browsing around to see what other bloggers were buying. I kept seeing a lot of the same striped tee, the same basic cardigan, and the same neutral mules. That left me feeling a bit relieved that these sandals are my sale gem. One of my finds that hasn't already been exploited all over blog land. In other words, I'm happy to have something different to share with you! The quality and fit of these sandals are just what you would expect from the Sam Edelman brand. They fit true to size - I'm wearing my normal size 6. Sometimes I will size up a half size for narrow fitting shoes as my feet are just a touch wide, but these fit perfect. I wore them for floral Friday at work and at first everyone was giving me crap for not wearing floral! I'd point to my feet and say, "uh, these are pretty amazing floral shoes!" And they could not argue. I wore them all day at the office and then ended up going to dinner with my boss and her husband after. My feet were perfectly fine even though I had them on for over 14 hours. I wanted to style them with shorts because even though they are jacquard, you really do not need to save them for a special occasion. Don't be shy to dress them down as much, if not more, than dressing them up! 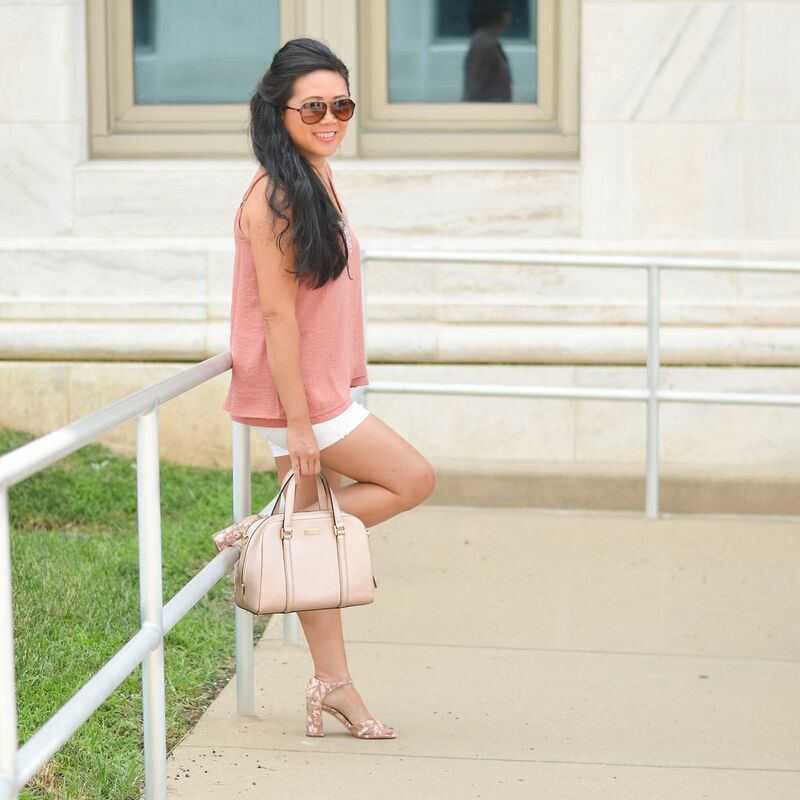 Pairing white shorts with things like metallics (like rose gold), textures (like lace), sassy shoes like this floral print, and then finishing off the look with a side-do are quick ways to elevate your shorts to a dressier feel. I wore this to brunch, but there's nothing stopping me from wearing this to a summer dinner as well. 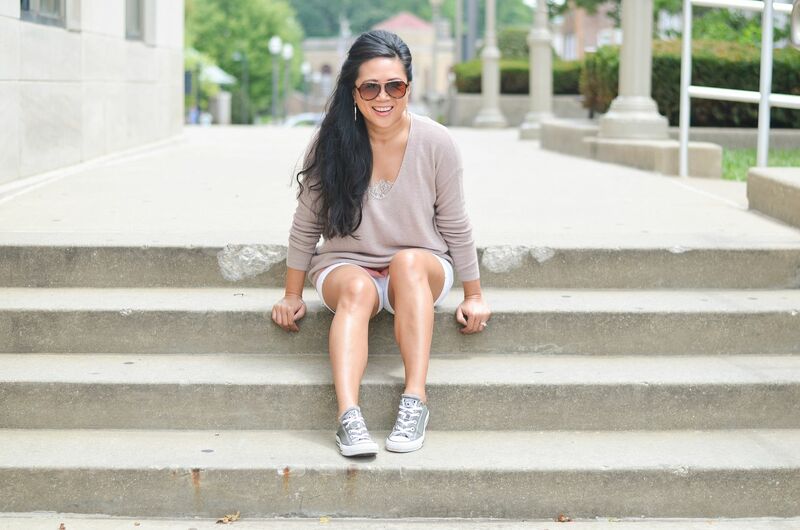 If you are like me and tend to get colder as the sun goes down, just throw on a lightweight sweater over the cami and let your feet relax with your favorite Converse. This outfit change is certainly not rocket science, but I love seeing the mood of this outfit change with just those two quick tweaks. 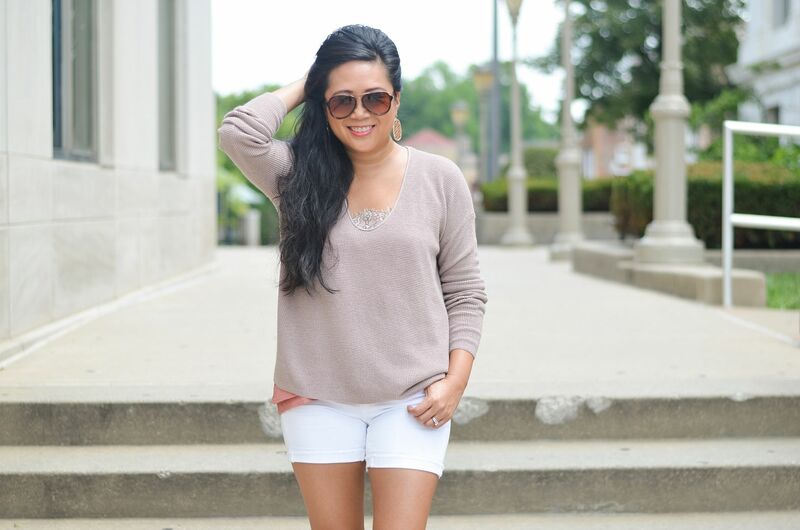 This sweater has the perfect relaxed fit without being all-consuming. I love the way the lace perfectly peeks out of the V-neck. The color is perfect for the warm months and will transition great into fall also! It's very lightweight, but still substantial enough to layer over the cami. (Sometimes super thin sweaters don't work well at all for top-layers because they aren't "heavy" enough if that makes sense.) I could totally wear this sitting around a fire eating a s'more. And now I want a s'more!!! Sorry my posting has been so intermittent since we got back from vacation! I will try to get back into a regular schedule again, starting this week! I feel like I have lots to share with you! Have a great week! Ha, love your description of how shorts interact with your mid section and I can totally relate. Really like both those shorts on you. My teen daughter loves AE, but you've got me thinking maybe I should try them too, for some things. You look so cute, this is the perfect Summer outfit. Your sandals are perfect!